This isn’t just our job, this is our life. Started in 2009, Gabe Adams built Bluewater Performance from the ground up. We have a profound love for Audi, BMW, and VW vehicles, and we want you to share in our passionate experience. As we all know, it’s not always rainbows and sunshine with these cars, but no one works harder than we do to take care of our fellow enthusiast. If this is your first European vehicle, you can trust our team of German auto specialists to not only service and repair your vehicle, but also to educate you about your car. If you are a seasoned euro enthusiast, trust that our fully equipped workshop can handle any performance itch you need scratched. 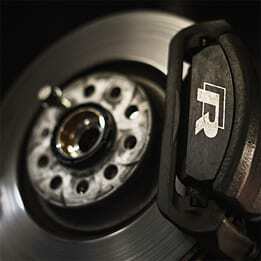 We pride ourselves on providing low-pressure service and repair, alongside competitive performance upgrades. Our dynamic speed shop is built on trust and grit. We hustle hard to guarantee your satisfaction. Got questions about tuning and performance? Check out our Performance and Tuning pages. Still have more questions, or if you want to talk to a real person? Contact us here. We offer competitive performance and low pressure service. We hustle hard to guarantee your satisfaction. Owner of Bluewater, Gabe left corporate America in 2008 to live his life, on his own terms. Every shop owner should be passionate, so what sets Gabe apart? His relaxed approach to life and motorsports. Gabe is not one for the hard sell, and high-pressure sales tactics will never define how Bluewater Performance takes care of its clients. Gabe’s commitment to motorsports is part of his DNA. From competing in Eurotuner Grand Prix’s, and PPHIC-Gabe also makes sure to encourage Ben and Jaryd in pursuing their own careers in motorsports. This unique combination of relaxedness and continued dedication to performance in being a German auto specialist has created a local shop with a very cool vibe. This is Gabe’s hallmark. Ben has grown up wrenching alongside Gabe at Bluewater Performance. Within his first week, Ben was rubbing elbows with Gabe in engine bays prepping fully built turbo motors for competition. Ben has grown under Gabe’s tutelage and today Ben runs the workshop, and enjoys interacting with clients while their car is in the shop. Ben has built some impressive street and show cars over the years, but today the apple of his eye is his E36 that he campaigns in auto-x. When you call in or message us on FB, chances are Jaryd will be on the line. But don’t let his cushy desk job fool you. Jaryd has grown up in motorsports. Like every Bluewater Performance employee, Jaryd enjoys his well-executed daily driver builds. Today he is dominating his class at the the PPIR auto-x series with the MkV GTI he built with his own two hands. Furthermore, Jaryd puts his degree in graphic design in play regularly, rewarding the Bluewater Performance audience with industry leading graphic images and artwork. Wanna see someone geek out on detailed engine service projects? Follow Ryan on social media, and you will see what it looks like when a German auto specialist loves what they do. In addition to rallying his Mk4 around town, Ryan loves skating, boarding and intermittent mountain biking. Ryan is currently looking for a new girlfriend, so if you know anyone, let us know! We took hundreds of photos of Alex, in hopes that he would agree on a different photo, but no such luck, Alex is super proud of his mustache, as well as his hairy chested Audi 200 big turbo build. Alex is an active member of the local enthusiast community, and like Tech Ryan, loves his work. Unlike Tech Ryan, we would not advocate anyone date Alex until he shaves the mustache. Mario, oh Mario. Coming from an tire shop background Mario started with us this past summer and has been a great addition to our Bluewater team. Proficient in oil changes, alignments, and tires, Mario is a huge help to the rest of the guys back in the shop. He will probably hate that we put this on here, but he loves his burritos. Seriously, he eats one almost every day. We have a new website, logo (in case you missed it) and message. Is this a new Bluewater Performance? Absolutely not. After being in business for 8 years in Denver, we decided that our website should be a better reflection of who we really are. We engaged in a lengthy process of discovering what our core values are. We then spoke to many of you via our marketing guy. You gave him very honest feedback, which was more honest than you would have ever been to us (we love you too). After studying your responses, we really began to understand what Bluewater Performance means to our clients. We also learned more about what we need to do better for you. What we want you to know is that in 2017, Bluewater Performance has not changed, but rather we have a better understanding of who we are, and who we want to be for our clients. If you know us-you can see that our website is an honest expression of who we are because it gives a sense of the low-pressure speed shop vibe that we have always perpetuated. Bluewater Performance was not created because Gabe Adams needed a job and a way to earn a living. Gabe already had that and he hated it. Gabe was working in corporate America, and it was killing him. Bluewater Performance was created as a means for him to do what he loved to do in Denver, and do it his way. Passion for us extends not only to what we do, but how we do it. Yes, we are seriously in love with cars. We eat, sleep, and breathe automotive performance. Being able to work on your cars, believe it or not, is us living our dreams. When you are excited about our work, it makes our day. We love our speed shop vibe, we love hanging out, and we love building cool cars. We are car guys, not sales guys. At Bluewater Performance, we don’t employ slick talking salesmen, instead we have Jaryd. Jaryd’s laid back attitude and background of growing up in the garage and at the racetrack makes for a great person to talk to about the builds you want. Jaryd built his Mk5 GTI to compete at PPIR’s Auto-X series. In its first season, Jaryd’s GTI dominated its competitive class. In the shop, Ben isn’t wearing a uniform. He’s wearing his favorite brand of air ride suspension t-shirt (again), and he keeps crying when Alex tries to rub his dirty hands on it. Ask Ben about his time working at Bluewater. And he’ll likely tell you that in his first week he was working side by side with Gabe, building high boost motors. Today Ben acts not only as lead tech, but also as shop foreman. Helping to guide the growth of his team, as Gabe did for him so many years ago. Ryan is working tirelessly in his corner of the shop only taking breaks to document his current shop project on Instagram. (We actually don’t have a bad thing to say about this, Ryan loves his work, and we all love that). Maybe our business would be more efficient if we had a service advisor who cared about hitting his bonus. Maybe more work in the shop would get done if Ben could actually work on cars and stop fussing about his outfit. Yes, Bluewater Performance is a business (and we’re doing just fine, thank you) and yes, we care about business things. But much more than that, we care about taking care of our clients, building cool cars, and enjoying our automotive life. Our team is our family, and we’re growing together. Some people may take a look at our new website, and say that we’ve changed, but they’re just throwing shade. Today, Bluewater is more Bluewater than ever. What is the Bluewater Performance satisfaction guarantee? Our satisfaction guarantee is our promise to you. We promise that we will work as hard as we can to take care of you and your vehicle while it is in our care. If you are in any way displeased with our work or our communication, we want you to tell us about it-contact us. We promise to do whatever we can to resolve your concerns, and show you exactly how important you are to us. This is not a money back guarantee, but our promise to our customers. Does Bluewater Performance offer maintenance and repair? Yes, we do offer maintenance and repair, and as German auto specialists, we specialize in German vehicles, including Audi, VW, and BMW. While we are very well known for our performance work, we do more maintenance and repair than anything else. All standard repairs are backed by our two-year warranty. Click on our maintenance and repair pages for more info. What do I need to know about performance tuning? 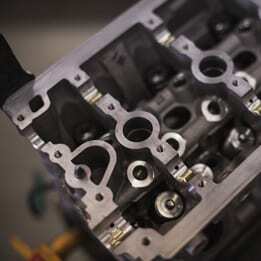 There's a world of information regarding performance tuning. What you need to know is that not every enthusiast needs the same level of education, let us know if you are new to the modifying your Euro, or if you are a seasoned veteran of the performance lifsetyle. We want to learn more about who you are, and how we can support your specific needs. What do you want out of your car? How do you use it? What is your budget? We will work with you to create a game plan that makes sense for you. Hop on over to our performance page to see how we can take care of you. What happens if I have a problem or are upset about my visit? Always feel free to contact us if you are upset; we need to know. Please call, or email us right away. All concerns will be reviewed by Gabe our owner. While we always strive for perfection, we aren’t perfect. We’d be lying if we said that we never made any mistakes. Should you be upset or concerned, right or wrong, please let us know so we can correct the issue immediately. We are here because we love our vehicles, and we want you to share in the ownership experience. Kinda. 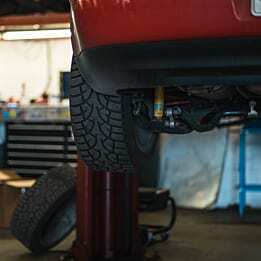 What we want you to know is that it is always best if we have the opportunity to supply our customers with the correct parts for their vehicle. We understand that you may have the opportunity to buy parts cheaper elsewhere. But we simply cannot guarantee that the parts you supply are correct, nor can we warranty them. About half of the time that customers supply their own parts, there is an issue. We don’t want there to be any issues. If price is a concern, please contact us before you elect to bring in your own parts. We are reasonable people, who love making our customers happy. Meet us halfway, ok? Do I have to pay for an inspection? We understand that many customers don’t see any value in inspections, and they really hate paying for them. So here is what we will do. For $85 we will check your fault codes and inspect your vehicle, in some instances, simply scanning the stored fault codes will give us enough information to proceed with repairs. However, that is not always the case. In the instance that our general inspection isn’t enough time to get to the root of the issue, we will always contact you before proceeding with any additional hours for an extended diagnostic. 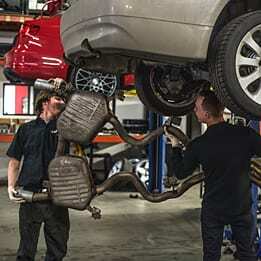 It is our job as German auto specialists to understand what the root cause of your problem is and repair it. This is why we can offer our two-year repair warranty. If there is any additional cost associated with our inspection, there had better be a very good reason, along with details on what was learned during the inspection process. Transparency is our ultimate goal and we will always work to satisfy our customers. Check out our repair page for more info. 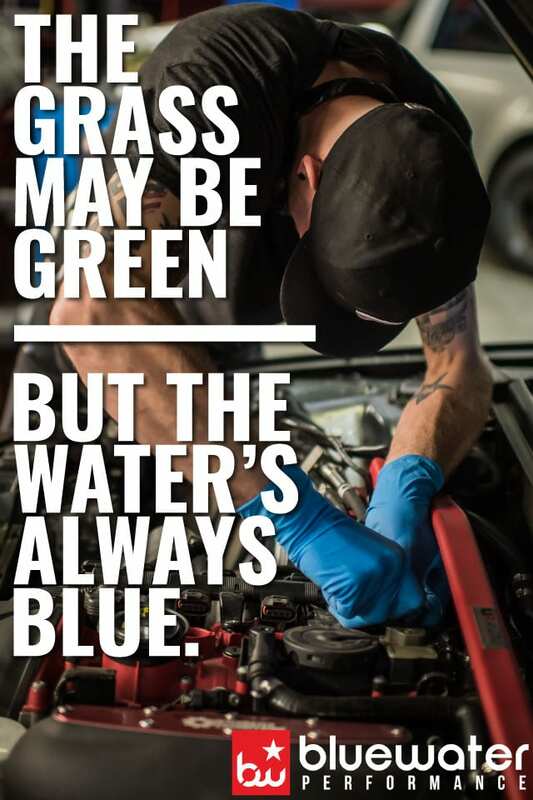 Why do customers choose Bluewater Performance? Great question! We have recently polled some of our customers, and they continue to come to us because we are fair, because they trust us, because we are passionate about what we do, and because we aren’t pushy. After thinking deeply about their comments, we decided that they are right! Give us a shot, we promise to hustle hard to guarantee your satisfaction. Will you work with me on repair costs? Maybe. 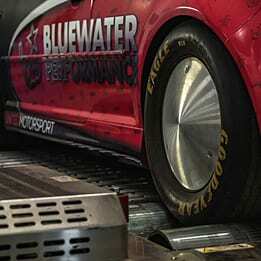 Bluewater Performance is a shop, not a corporation. We are here to genuinely help people, but if we split repair bills with all of our customers, we wouldn’t be in business today. If you promise to be a good and loyal customer, and a reasonable human being-we promise to have your back if and when you are in an unfortunate situation. Talk to us, we’ll listen, and if it’s warranted, we will do what we can to help. Are you guys open on the weekend? Here at Bluewater Performance we are not open on the weekends, but we're open from 9am to 6pm Monday thru Friday. 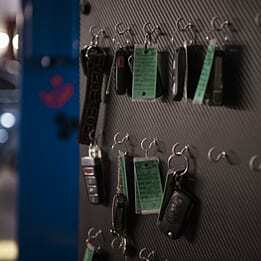 We do offer the option for customers to drop off thier vehicle in our lot after hours or on the weekend. Give us a call to schedule a drop off!